In the Radiophonic Database, tape TRW 7568 is credited to Delia and labelled "Music of Africa: Tutankhamun's Trumpet", produced by Jack Aistrop for BBC Enterprises. This appears not to be what appeared on the album The Music of Africa as Tutankhamun's Egypt because the programme that was for was produced by Paul Johnstone. 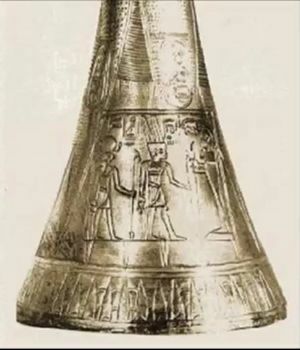 There is a similarly-named recording of Tutankhamun's silver trumpet from 1939, which Delia used to create the piece Tutankhamun's Egypt. In the BBC Sound Archive on tape TRW 7568. ↑ The Tape Library List's entry for TRW 7568. This page was last modified on 17 February 2015, at 01:39.